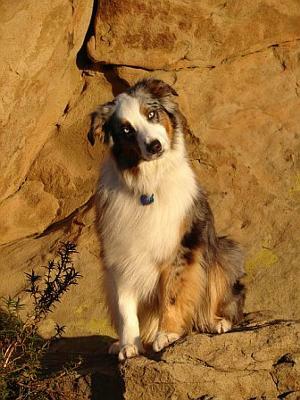 Cody Bear - "Likity Spit Go"
Cody Bear, (AKC Registered name: "Likity Spit Go"), an Australian Shepherd, was born on June 11, 2003 and lives in Lake Havasu City, AZ with his trainer/owners. In Cody's first year, he earned 3 titles in Flyball and now has a total of 5 titles (FDCh-Gold). He's trained in sheep herding and advanced agility and competes in frisbee and dock diving competitions. His longest dock diving jump was at 18 feet. And boy can this guy run fast - His running speed has been radared at 35 mph! We also have participated in flyball and frisbee demonstrations at Dog Event/Shows, Pet Adoption Fairs, Expos and charity events. Cody was in a recent "Advair" (asthma medication) commercial and has done some video shoots as well. He's also been seen on dog events on Animal Planet and ESPN. Every year, he participates in the Lake Havasu City Annual "Pooch Party in the Park" in November as the only K9 entertainer. He puts on quite a show performing agility, flyball and acrobatic frisbee. His favorite place to go in Lake Havasu to visit is Scraps Dog Bakery. He loves to see his best pals and owners - Dorita and Scott! Cody's little sidekick, Quigli, a Cavalier King Charles Spaniel, is trying to follow in his much bigger footsteps. Quigli dives and swims in the pool with him, plays frisbee and agility and even enjoys stealing toys from Cody. At home, Cody takes pleasure with helping with chores around the house (taking socks and towels out of your dirty clothes hamper) and just being a big clown! He's definitely entertaining and is sure to make you laugh! Cody's personality and attitude is best summed up with "Bring it on and let's do it". His drive and willingness to please makes him that much more enjoyable! We feel blessed to have such a talented, loving and loyal companion in our lives! He's truly amazing and one of a kind! Comments for Cody Bear - Our Truly Amazing Aussie! My beautiful Cody Bear left this world on August 17th. He was an absolutely amazing dog and changed my life forever as well as others. He touched the hearts of many that he met all over the world with his talents and beauty and performed in front of. Even months after his death I don't know how to live without him. He was my world and I miss him so much. He brought so much happiness to my life and my moms. He actually died 5 weeks after my dad died and it's been very difficult. Now I realize with all I did with him (flyball, agility, dock diving, frisbee and sheepherding) was for a reason. To keep doing what I did with him was the one reason to let his legend live on. Cody Bear will always be my "Heart Dog" and he will be the one I treasure the most. Probably because we did so much together and we were so close. There will never be another like him. What ever he did always pleased a crowd or just one person. He made you laugh and he caught your eye with his beauty. He was breathtaking. He was beautiful and full of life. Now he is with my dad and that gives me peace. I just miss them both. He will forever live in my heart. Thank you buddy for all you gave me and all that you taught me. You showed me what life is all about! I will miss you Dearly and you will live in my heart forever! Thank you ... My Dear Sweet Cody Bear! A.K A Likity Spit Go! Cody is truly amazing and touched so many lives! We love him dearly! Even nearing 8 years old he's still goin strong and healthy as ever! He's on Facebook if you want to see more of him. Sounds like your family has the same love for dogs! We have been thrilled with Cody's performances every year at he annual "Pooch Party in the Park". He has become an inspiration to many dog owners in Lake Havasu City AZ. Because of him and his owner Michelle, more people are having fun with thier dogs. The "Havasu Hot Dogs" a dog sports team has been started now, because of his influence,and we are having great fun. They are practicing to perform at this years "Pooch Party in the Park" on November 20th and 21st 2010. All dog owner are invited to come to the fun event in the beautiful lakeside town of Lake Havasu City AZ. We will have a web site up soon. Check it out. My family and I are dog lovers with two Samoyeds living in Southern CA. Sofie was rescued from the local shelter 8 years ago and Holly our playful one was a gift from Santa to Emily, Katie and Grace two years ago. Both Sami's have unique characters and definitely are amazing animals. We live next to the Dog Whisperor and Sopie had her 5 min of fame which she continues to brag about year after year. We love Aussie's and find your story on Cody very touching. Take care and give that Cody a big hug from the Lin's.